There are some hikes that I could do over and over again without ever getting tired of them. Spending a Sunday afternoon to let off some steam or recharge my batteries before the new week, contemplating life or simply enjoying the incredible natural landscape here in the wonderful SalzburgerLand. 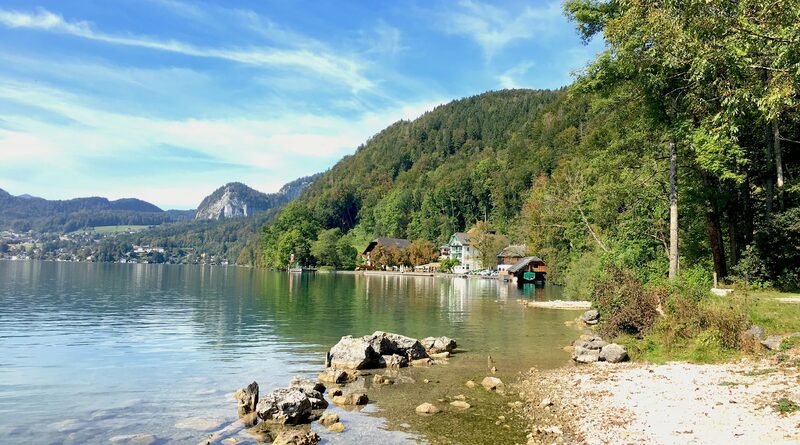 One of these hikes leads up to Falkenstein mountain at the beautiful Wolfgangsee lake. What I enjoy so much about this half-day tour is that you are walking on a truly historical trail here. 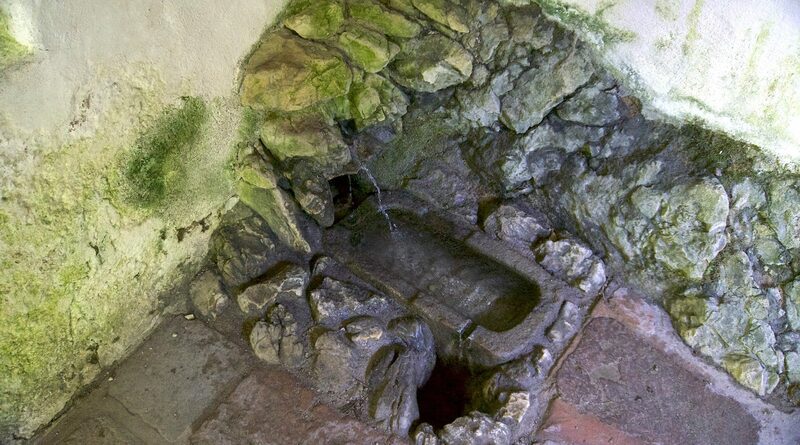 The middle ages already saw people going on pilgrimages up to the Falkenstein mountain, visiting the hermitage of Saint Wolfgang and taking home a small bottle of miracle water from the healing spring close to the church. Today, I begin my journey at the parking space of the Fürberg guesthouse directly by the lake. Even though it’s not even nine in the morning yet, the sun is already smiling down on me, promising a wonderful summer day. 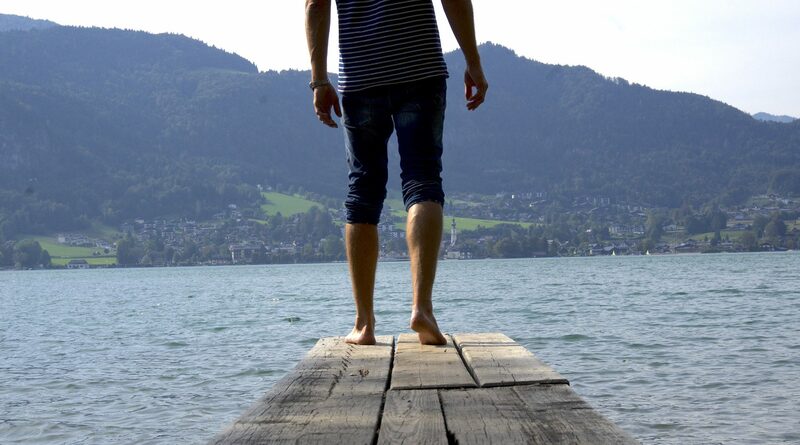 And that can also be discerned from the first swimming guests arriving at the lake, eager to spread out on the sunny meadow and dip their feet into the water. And I’m also already looking forward to a head jump into the lake, but work comes before pleasure! First, I need to make it up onto the Falkenstein mountain. The Pilgerweg 28 trail leads me onto a relatively steep forest road and after a few minutes, the first sweat droplets are rolling down my forehead. I keep noticing the nice information points spread out along the way from which you can deduce all kinds of things about the history of the trail, the pilgrims, Saint Wolfgang and the holy water. At the fork to the Scheffelblick viewing point, I take a short rest and look at my hiking map. The direct path to the hermitage and then to Falkenstein mountain actually continues on a straight path, but I don’t really want to miss out on the wonderful view that you are supposed to have up there on the Scheffelblick viewing point. Well, nothing ventured, nothing gained, and so I opt for the narrower path to my right. Over rough and smooth, I make my way through the thick forests whilst the lake’s blue hue sparkles through the green of the forest from time to time. My anticipation increases in proportion with the increased meters climbed. After approximately half an hour, a small arrow points toward a neat little wooden hut at the edge of the path. It doesn’t happen all too often that I am rendered speechless, but the view in front of me here manages to achieve that effect rather quickly. What a spectacle of nature, this might just be the most beautiful view in the world! I take in the panorama for what must be at least 30 minutes, taking countless pictures and rejoice in having made the right decision at the fork in the trail. 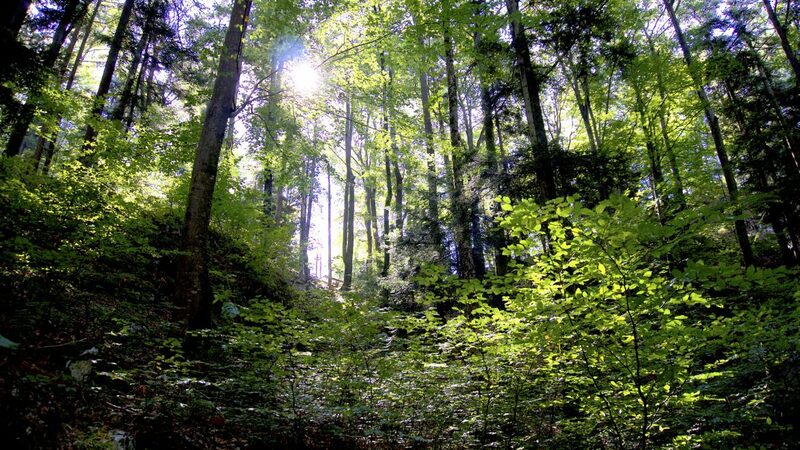 Several metres further uphill, the forest opens up and presents a small plateau at the highest point of my “detour”. The view from here is similarly breath-taking and you can take it in from one of the comfortable wooden loungers. Someone really came up with something extraordinary here. After a quick break and a sip of water, my journey continues. And this time it’s downhill. The lake looks absolutely mesmerising while looking down on it and the white sails of the sailboats complement the idyllic and picturesque scene. The light breeze is thus not only good for us hikers but also makes for an excellent day out on the water. At the Aberseeblick view point, incidentally the highest point of the hike (yes, it will take you uphill once more), I take out my camera once more and literally take hundreds of pictures. Yes, moments like this should be captured for eternity. The way to the chapel leads me back through an old deciduous forest, and I have to climb mounted stairs and small rises over and over again. Hiking is so much fun here. 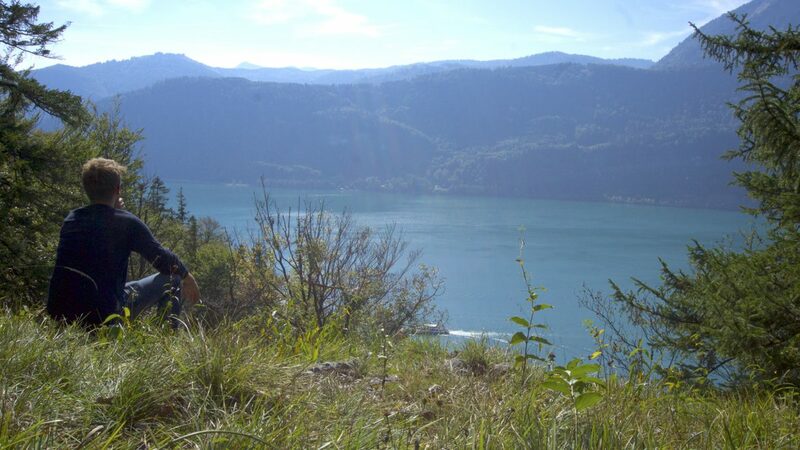 Saint Wolfgang could not have picked a more idyllic little spot for his hermitage. The little church is located on a sunny clearing right next to a tall rock wall, which together almost fuse into a single element. Supposedly, bishop Wolfgang had joined to the Mondsee monastery in the year 976. Due to turmoil caused by the war between Emperor Otto II. and the Bavarian duke Heinrich II., also known as “the Quarrelsome”, he had grown tired of people and their conflicts and longed for life as a hermit. And that is what he found here at Falkenstein mountain, where he lived very secluded for many years, dedicating himself to prayer. And that is also where the small church is supposedly located today. Cheerfully, I climb the last couple of metres and walk up the stairs when I suddenly stand inside a small and very pretty sanctuary. Pilgrims that made their way up here believed that one of the rock passages to the upper right of the altar was a place with a special sort of energy that could also promote one’s health. Well, I guess I will have to crawl through it as well then, even though I happen to be of excellent health at the moment. But if it doesn’t do anything good, hopefully it won’t do anything bad either! On my way back, I also ring a tower bell, which, if you ring it three times, is supposed to be make your wishes come true. In close vicinity to the church, one can also find another small house in which the Falkenstein healing spring is located. Legend says that Saint Wolfgang had a friar as a companion who could not cope with the ascetic life and without drinking water. And thus, Wolfgang pierced his stick into the ground and, miraculously, a spring with fresh water emerged from it. Nevertheless, the monk ended up leaving the bishop alone in his hermitage but the spring continues to exist to this day and has been known to have healing properties for many centuries. Supposedly, it has a truly miraculous effect on the eyes. Since the 14th century, Falkenstein mountain has been the fourth biggest pilgrimage site in Europe. Up to 80,000 pilgrims come here every year to fill the crystal-clear water into the so-called “Wolfgangiflascherl” (Wolfgang Bottles) and take it home where they use it as remedies. Still today, so it is said, the countless blue and white shards of glass in the floor are a testimony to this tradition. After a sip from the spring, better safe than sorry, I make my way back down to the lake. The sun has gotten rather hot in the meantime and I can’t wait to finally take off my hiking boots and jump into the lake. This will, without a doubt, not have been my last visit to Falkenstein mountain.